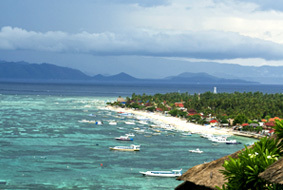 All of our routes to and from Lembongan Island touch base at Jungut Batu Bay on the East side of the island. 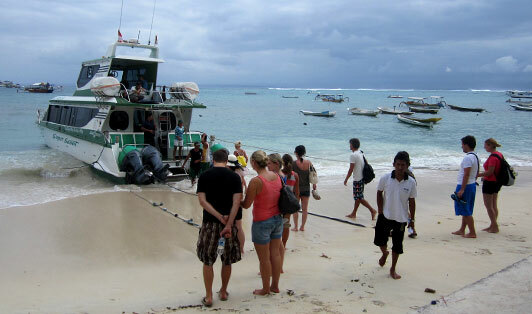 It's a glorious entry, as the ferries and fast boats navigate their way past the legendary Lembongan surf breaks, Playgrounds and Lacerations. Keep your camera or binoculars at the ready. Once on the island, Jungut Batu Beach is really pleasant, with good value cafes and beach houses, and views of Mt. Agung in the distance. It all enhances your travel day experience and you'll be pleased you came. On departing Lembongan from Jungut Batu Bay, the pick-up point will be quite clearly marked and you'll not miss it. Make sure you are around 30 minutes early and you'll see other people gathering also. The fast boat operating staff will also be nearby and will assist you with information. Make sure that you have your printed e-ticket on hand. The boats will actually dock on the beach, so when you embark and disembark, your feet and ankles will get wet, so don't forget to dress appropriately. Enjoy yourself, it'll be plain sailing! Address : Jungut Batu Bay, Nusa Lembongan.